Megan: Wait... There's THREE Cookbooks This Month?! We use a lot of cheese in my family, but sometimes, we purchase cheese, and don't end up using it right away. I typically throw my cheese in the freezer, and most of the time this works out great. Once in a while my cheese does not fare so well in the freezer. If you have ever thought about freezing your cheese, but weren't sure if it would be safe, this article is for you! Freezing cheese, especially already grated cheese, saves me a lot of time, effort and when I purchase a larger block and shred it myself it saves me considerable amounts of money. The result from frozen cheese can be a little less than fresh, due to the formation of ice crystals and slight drying out of the cheese. Due to the slight changes, frozen cheese is best used in recipes. The best cheeses to freeze are the hard and semi-hard varieties. These would be the typical mozzarella, parmesan and cheddar. Provolone, Romano and Swiss also freeze well. The soft cheeses do NOT freeze as well. Soft cheeses are cream cheese, cottage cheese or ricotta. I have however frozen cream cheese blocks before, and as long as it is being used in a recipe where it is mixed up it is fine (the cheese and the liquid does separate but can be easily mixed back together again). I would not suggest freezing plastic containers of cream cheese. You can typically freeze any cheese that is bought pre-grated, as the moisture content of these cheeses has already been altered. I suggest leaving it in its original packaging (I don't know why you would take it out, since it is so conveniently packaged and shredded for you anyway).  Leave cheese in original packaging, if possible.  Cheese balls can be frozen.  I have frozen cheese singles (the individually wrapped ones) with success.  String cheese can be frozen.  If storing sliced cheese, place wax paper in between layers.  Wrap cheese as tightly as possible in plastic wrap, then in a plastic, zipper bag.  Remove as much air as possible from the packaging. This prevents those pesky ice crystals from forming.  If you freeze hard cheese in frozen blocks, it is possible to grate frozen.  Some cheeses, such as cheddar and mozzarella may become crumbly after being frozen, to prevent this problem, shred those cheeses prior to freezing.  All cheeses should be thawed in the refrigerator prior to use. 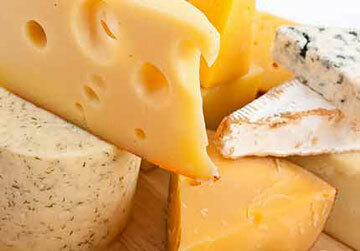  Cheeses have a freezer life of 3-6 months. I have personally found this to be a great solution when we have excess cheese or if I don't get to a recipe that I have purchased cheese for. Having the cheese grated and then frozen has also saved me a ton of time! I hope this tip helps you and your kitchen!